2018 marks 100 years since the end of the First World War. 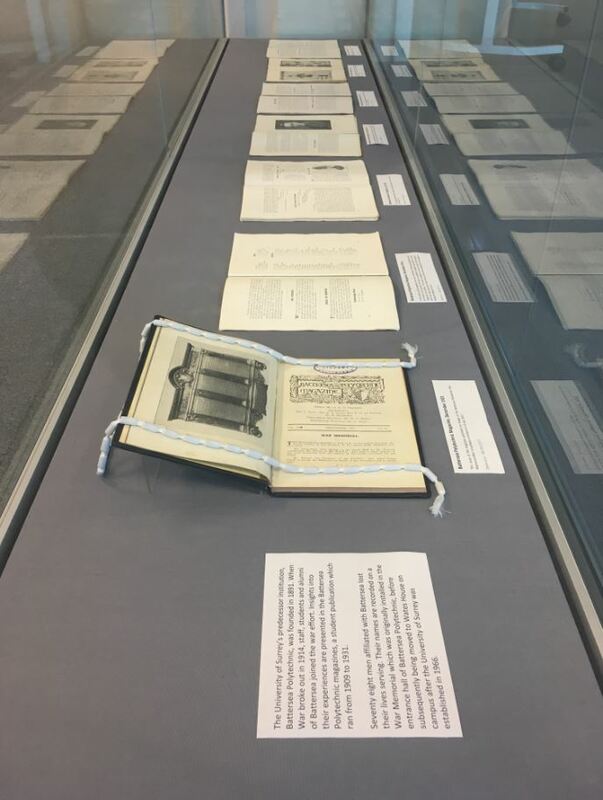 To commemorate this centenary, Archives & Special Collections have curated a display of relevant material from our collections, including issues of Battersea Polytechnic magazine produced by students during and immediately after the War. As well as publishing updates on the various clubs and societies at Battersea, the magazine also recorded the names of alumni, staff and students known to be serving in the War; letters from them; and tributes to and photographs of those who lost their lives. An obituary for Henry Edmund Bulbeck was published in the December 1916 issue of the magazine. Bulbeck enrolled as an Engineering Student at Battersea Polytechnic and was about to enter his final year of study when war was declared. He joined the army at the outbreak of war in 1914 and after training was posted to Gallipoli. He suffered a gunshot wound in 1915 and was given a month’s leave to recover. After returning to service, he was killed in action on the Somme on 6 November 1916. Bulbeck’s obituary reads “Unadulterated patriotism sent this bright and well-beloved youth to the trenches. All honour to him. We mourn with his family; those of us who knew him well feel his loss very keenly”. He was 22 years old when he died. The March 1917 issue includes a short piece on Sister Kathleen Flower. Sister Flower was a Domestic Science student at Battersea Polytechnic from 1904-1906. She went on to train as a nurse and went to France when war broke out. Sister Flower was awarded the Royal Red Cross of the First Class for her services. As 2018 also marks 100 years since the passing of the Representation of the People Act which granted the vote to women over the age of 30 who met the property qualification, it seems particularly pertinent that this item ends with “Perhaps, when all this dreadful turmoil is over, we shall realise rightly and more fully the unmeasured sacrifice of these brave women, and shall show them that we appreciate all that they have done for the Empire and for humanity”. In December 1921, the Battersea Polytechnic magazine published an image of the Battersea Polytechnic War Memorial after it had been unveiled on 14 July 1921. This records the names of the seventy eight men affiliated with Battersea Polytechnic who lost their lives serving in the War. Those wishing to find out more about these individuals should consult Jean Shail’s book Students at War: The Lost Generation of Battersea Polytechnic 1914-1918. 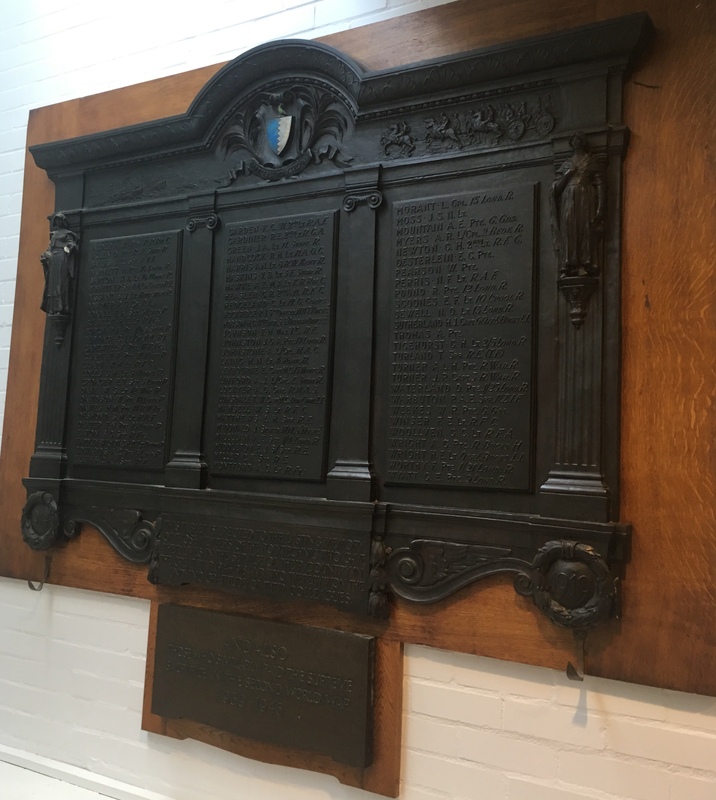 The memorial was originally installed in the entrance hall of Battersea Polytechnic, before subsequently being moved to Wates House on campus after the University of Surrey was established in 1966. Alongside the Battersea Polytechnic magazines, we have items from our E H Shepard Archive and dance collections in the display cases in our Research Room. 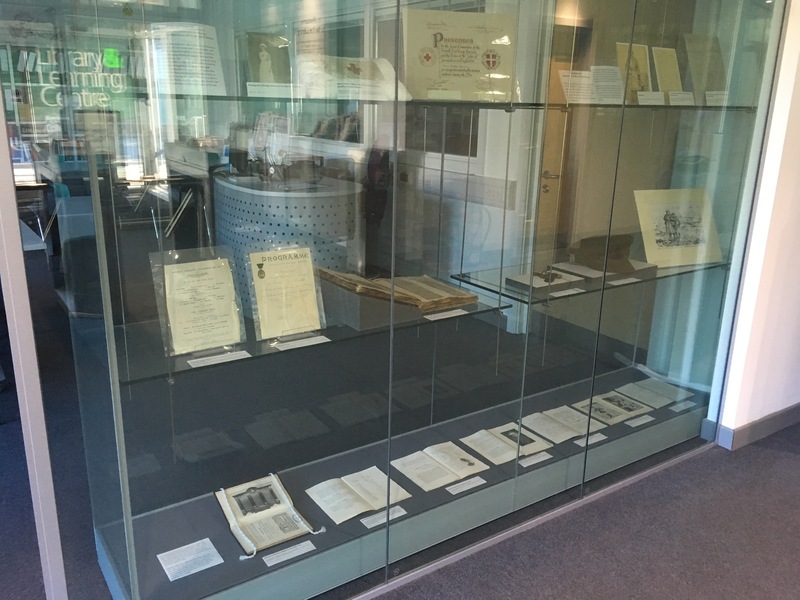 Content includes letters, drawings, items of uniform and photographs, and will be exhibited until the end of November.